But during these three days hiatus, there was really only one piece of news: after an anguished debate, the Coordinadora Democratica, CD, has decided to go and try to re-validate at the very least 600 000 of the signatures it claims it has collected. The opposition needs 2.4 million valid signatures to force a Recall election on Chavez mandate (20% of the electorate). After a lot of huffing and puffing the opposition forced a Chavez controlled Electoral Board, CNE, to admit that it had collected 1.9 million approximately. Approximately because even though this result was announced March 2, to this very day nobody knows for sure what is the exact number of valid signatures. So let's assume that this 15.6 % of valid signatures is indeed valid. The first comment is that it is quite a result for the opposition. To remove Grey Davis from California took quite an effort to barely make it to 10%. The Venezuelan Opposition managed 15.4% in 4 days collection. Just to put some perspective. Now the CNE has grudgingly accepted that 1.2 million signatures might be repaired, or claimed or re-validated. Whatever. And it will give 3 days, in about a month or so, for these 1.2 million folks to step forward and confirm that indeed they did sign up. This takes place all in front of a legal battleground that is dividing the opposition. A large sector of this one would have preferred not to go to a repair process. Their position is that the CD should have forced the High Court to decided between two contrasting rulings from two of its divisions, the Electoral Court and the Constitutional Court. Critics of this position point out that 1) the final result is not assured to favor the opposition, 2) the Electoral Court is aware of this and thus exhorted the parties to try to make a deal instead of waiting for a final ruling, and 3) who knows when the final ruling would come, probably too late for a Recall Election before August 19. 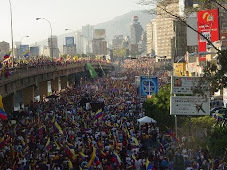 Failing to meet this date will ensure the survival of the regime until 2006, even if Chavez is recalled. Eventually cooler heads prevailed: all agreed that whichever the final decision would be, all would back it. But there are several serious problems still to overcome and it would be a temerity to affirm that the decision is final. The resolution of at least some of these problems is necessary. The long negotiations between the opposition and the CNE to agree on some framework for the repairs have yielded a solution that has pleased few, if any. Regardless of the merits of the rules agreed upon, in the last few days a few major issues have come forward, issues that must be resolved if the process has a chance to reach success. Some of them below. Some people signed and do not appear anywhere. Amazingly that even happened to some major political leaders from both sides. Ledezma and the vice president share that dubious distinction. And it is notorious that they signed as TV watched when the did so. Where are the forms that included their signature? Can the CNE be THAT disorganized? But more importantly, will these people be able to claim their citizen's right to have participated in the process? We are talking 0.3 million people here. Chavismo will "convince" people to withdraw their signature. This gravest, and fascistic, breach of ethics is scandalous enough as it is. On the ridiculous side it confirms that no "megafraud" was committed since chavismo amazingly confesses that it must convince at least 0.25 million to withdraw their signature or not show up to re-validate it (they assume that 40% will not show up, that is why they need "only" 0.25 million). In other words they admit that indeed most of the 1.2 million that must be repaired are probably true signatures!!! 1.2 + 1.9 = 3.1. So the fraud would have been 0.3 out of the 3.4 claimed originally by the opposition. Hardly "mega". But this could be left for the lore of Venezuelan politics if it were not carrying further meaning. Chavistas by these declarations claim that they have the right to "alter" the decision of people while the opposition cannot add more people if it could do so. This by itself illustrates quite well the real fraud that was committed by the pro-Chavez CNE. Can the CNE allow such blatant pressure on the electorate? Were there not rules emitted before about the point of taking finger prints as the only way to cancel one's signatures, by proving that someone else had signed for you? Unfortunately recent declarations of Rodriguez indicate that the job will be made easier for the chavista side. People with "valid" signatures can withdraw. This is of course an extension of the preceding consideration. And this does not seem to have been contemplated previously as it seems to be considered now. Besides allowing further pressure on public employees that signed, one side effect is that it raises all sorts of conspiracy theories. One example is the theory that the government is cloning a series of fake ID so that while people that have valid signatures stay at home peacefully, someone with a fake ID with their ID number goes to annul their signature. Not a large scale operation obviously but a few thousand could be removed this way. A few thousand here, a few there and voila! The magical 0.25! The data is not complete. When will this one be complete? The opposition needs the data so it has time to track its supporter to inform them. It will need it to prepare the necessary logistics. Every new delay of course complicates the task of the opposition. What are the chances to succeed? In front of such a possibility of treachery from the Chavez agents at the CNE one is justified in wondering if it is worth the effort. The divisions within the opposition are understandable. Unfortunately there is no other way right now. All the other options, ranging from hoping for a favorable high court ruling to plain civil disobedience can still be tried out if the Recall Election bid sinks in a sea of treachery. All have very high risks to lead to serious violence which is what the government seems to want, at least since February 27. There is a simple truth that must impose its wisdom right now to all factors within the opposition. Since the CD has chosen the strictly legal and electoral path, the Chavez regime has been making mistakes and losing points. The road has been long but it has been paying off. If the opposition wants to use fraud as a reason for further action, in particular from the international community, it must let the fraud happen for all to see. Until now the administration, through the CNE, has been very careful when cheating: no massive fraud can be claimed. But it has also reached the moment when it will need to perform that massive fraud to stop once and for all the march to the Recall Election. For as hard as it will be to witness such a fraud, the opposition must take the chance for it to happen. It must grin and bear it to finally unmask the true nature of the regime, once and for all. The Regime would be losing in both scenarios. If it balks at the final massive fraud then it must go to the Recall Election and we will know if people are behind Chavez as he claims. If he orders the fraud then he will have to deal with the consequences, internal and external. I am rather pessimistic as for a favorable outcome of the validation process, but it has to be taken. The chance is slim but it exists and it is still better than marching against the tanks. We claim to hold the moral ground and we must prove it to the world by taking the chance and go through that hopefully last obstacle.